A new provision in the tax cut bill that is headed for a vote in the Senate could undercut the financing mechanism that has been a major driver in the rapid growth of renewable energy projects. Four trade organizations representing a broad swath of the renewable energy industry sent an urgent letter to members of the Senate, asking them to reconsider the Base Erosion Anti-Abuse Tax (BEAT) provision, which they say could have a “devastating” effect on renewable energy projects. The BEAT provision is designed to make it harder for corporations to dodge taxes, but it would also sweep up tax credits — such as the renewable energy Production Tax Credit (PTC) for wind power projects and the Investment Tax Credit (ITC) for solar projects — making the credits more difficult to monetize. Microgrids have garnered renewed interest recently, but will these facilities become mainstream? Find out in the free ebook. Until recently, the renewable energy industry had been hopeful that the Senate’s tax cut bill would leave in place existing incentives for wind power. The House’s version of the tax cut bill makes changes in the calculation of the PTC that could “kill” over half of planned wind farms, Tom Kiernan, CEO of the American Wind Energy Association, has said. Members of the renewable energy industry took some comfort in the prospect that the House provisions would never make it past the Senate, where there is strong support for wind power. Until last week. It appears that the BEAT provision was inserted in a last minute mark-up of the Tax Cut and Jobs Act in the Senate finance committee on Thanksgiving eve. The provision means that the Senate bill “keeps the credits alive, but eliminates their value,” Greg Wetstone, president and CEO of the American Council on Renewable Energy, told Utility Dive. Wetstone pointed out that the BEAT provision would affect $50 billion in annual investment in renewable energy projects. His organization is one of four that sent a letter to members of Senate. The others are the American Wind Energy Association, Citizens for Responsible Energy Solutions, and the Solar Energy Industries Association. “We do not believe it fair or appropriate for Congress to reduce the value of tax incentives that have been relied upon in good faith by investors and developers,” they wrote in the letter. The BEAT provision targets “earnings stripping” — cross border payments multi-national companies make to overseas affiliates to reduce their tax bills. The provision aims to close that loophole by setting a minimum tax of 10% of taxable income. The provision would require every company to quantify 10% of their taxable income, including cross-border payments and, in a second calculation, quantify their tax liability, excluding any tax credits. If the tax liability is less than the taxable income calculation, the government would collect the difference as a tax. The provision applies to all tax credits, except research and development credits. The BEAT provision would make it harder for “banks and other large companies that are the principal source of tax equity for renewable energy to know, when closing on tax equity investments, whether they will receive the tax credits on offer for making the investments,” Keith Martin, a partner with Norton Rose Fulbright, wrote in a blog post. “Any large bank or insurance company in the tax equity market is potentially affected,” Martin told Utility Dive. That could include JPMorgan, Bank of America, Citibank, Goldman Sachs, Morgan Stanley and foreign banks such as RBC, Credit Suisse and BNP. Because the BEAT calculations would have to be performed every year, they would, in essence, be retroactive. Wind projects collect the PTC over a 10-year term. So, in any given year, a tax equity investor would not know the value of a tax credit until the end of the year. Solar projects are often funded with the ITC, but the value of that credit would not be certain at the outset of the project — only at the end of the year in which construction is completed. The BEAT tax would apply starting in 20118, but “credits would be clawed back on [PTC] deals closed as far back as 2008,” Martin said. Wetstone says the trade groups are advocating that the BEAT provision be revised so that the PTC and ITC are given the same treatment as R&D tax credits. That, the trade groups say, would restore the certainty that underpins the tax equity market and, by extension, the growth in renewable energy investment. We bring homeowners together into a group, or co-op. We provide unbiased, installer neutral support to co-op participants through each state of the process of going solar. Our experienced team ensures you understand how solar works, how it can be financed, and how it can be installed on your home. Co-ops take advantage of the group’s bulk-purchasing power to get discounted pricing and a quality installation. Volunteer co-op members choose an installer on behalf of the entire group through an open and competitive bidding process. The selected installer provides co-op participants a personalized proposal for their consideration. Watch the video below to learn about how solar co-ops work and what the benefits of going solar with our co-op, or view our FAQs. The 51st State co-op will be open to all District residents, regardless of income levels. As a DOEE-funded Solar for All project, the co-op will focus on expanding access to solar for low-income households. Low to moderate income households may qualify for Solar for All grant funding from DOEE that Solar United Neighbors is administering to cover the cost of solar arrays. For qualifying households, the solar array paid for by Solar United Neighbor’s Solar for All grant could reduce your electric bills by 50% over the course of a year. The 51st State Co-op is open to all District residents. You could qualify for a free solar installation under Solar United Neighbor of D.C.’s DOEE grant. Can’t make our info session? With support from The Department of Energy and Environment (DOEE) Solar for All program, certain income qualified homeowners may be eligible for the installation of a solar system at no cost. SunShot expects to make 7-10 awards under Solar Desalination, each ranging between $500,000 and $5 million for a total of $15 million. Prior to submitting a full application for this opportunity, a brief, mandatory concept paper is due on December 4, 2017. See all application deadlines in the table below. NASA is currently accepting applications for Summer 2018 internships. NASA’s live-streamed Virtual Career Summit held Wednesday, September 27th is still available online for students interested in internships, fellowships and scholarships at the space agency. The NASA Internships, Fellowships and Scholarship program (NIFS) showcases some of its missions, programs, interns and mentors. Students can learn about the current available internship, fellowship and scholarship opportunities in the STEM (Sciences, Technology, Engineering and Mathematics) fields and others, and eligibility requirements, tips for the application process and hear from previous NIFS awardees. The virtual event engaged students and NASA professionals in a question and answer session recorded during the event and also available online where you can continue to ask questions. The National Science Foundation launched the Historically Black Colleges and Universities – Excellence in Research Program (HBCU-EIR) as a track within the new HBCU-UP Solicitation NSF 18-522. In response to the Consolidated Appropriations Act of 2017, this is a high priority program for the Agency. It will provide strategic opportunities for HBCUs to stimulate further research and strengthen research capacity. a) Collaborative research projects of up to $1 million that are expected to build and support the development of research capacity at HBCUs. Projects must have a research focus in one of the research areas supported by NSF, and a direct connection to the long-term plans of the host department(s) and the institutional mission. Proposers are encouraged to establish a research collaboration with one or more additional HBCU partner institutions to work with faculty and to build and expand research capacity. b) Research projects of up to $500,000 to support research by individual PIs. The project should help to further the PI’s research, to improve research capacity at the institution, and to involve students in research experiences. Collaborations are encouraged. For further information, please go to the above linked document. Of course, HBCU-UP still supports STEM research and education at HBCUs through the existing funding opportunities, including Broadening Participation Research Centers, Implementation Projects, Targeted Infusion Projects, Research Initiation Awards and Broadening Participation Research Projects. Announces funds to support community-based organizations in their efforts to collaborate and partner with local stakeholder groups (e.g., local businesses and industry, local government, medical providers, and academia) as they develop and implement solutions that address environmental and/or public health issues for underserved communities. The company SolarReserve built the 110 megawatt Crescent Dunes Solar Energy Plant in southwestern Nevada. It creates enough electricity for 75,000 homes and stores thermal energy with molten salt. The plant uses mirrors instead of conventional solar panels and is one of several such facilities in the Southwest. Peiwen Li: Molten salt keeps as a liquid for a wide range of temperatures, and it stores a lot of thermal energy, so you can store the energy for use during the night or during the bad weather time. Ryan Heinsius: So, essentially it’s just a big battery. PL: Correct. To some sense, yes, it’s a battery. It’s a huge tank of salt. It stores energy in the form of thermal energy, not electrical energy. And when you use thermal energy you need to pump up this hot fluid and then go to the power plant to use the thermal power plant to generate electricity. RH: Maybe you could explain to me why energy storage is such a big problem facing the renewables industry. PL: Generally, after sunset people need another six hours to have electricity—people go home and they use a lot of electricity. So you need to supply the power if you rely on renewable energy to do that, and then energy storage is so critical, it’s important. And compared to any other energy storage method, thermal storage can be a very good choice because you can store a large capacity of energy. People use batteries but the storage capacity is very limited. So you cannot expect a power plant to have battery to store that huge amount of energy. Huge tanks of molten salt store thermal energy at SolarReserve’s solar facility in Nevada. RH: Are there any negative environmental aspects or effects from the use of molten salt energy storage? PL: All the salt we use there is no toxicity and they are natural materials. For example, potassium nitrate is a kind of fertilizer salt. Sodium chloride and magnesium chloride salt, these are the materials people in the north use to melt snow during winter. Sodium nitrate is also a well-known material. So, they are friendly salts. There is no big concern regarding the environmental impact. RH: Hundreds of people stand to be laid off if the Navajo Generating Station here in northern Arizona closes. Could this technology potentially save those jobs? PL: So far, I’ve never heard of any country, or in the U.S., any plan to convert a coal-fired plant into a solar thermal-based power plant, yet. Once it starts running the jobs for maintenance probably will be much less than the coal fired plant, because in a coal-fired plant you have workers to deal with the waste from the power plant and so on. But once the solar thermal plant is constructed it’s really clean and the maintenance jobs are reduced. The 110 megawatt solar facility in Nevada. RH: Is solar power using molten salt storage a viable alternative to coal-generated power or other fossil fuels? PL: Yes, I think it will be widespread particularly in this region where the solar energy resources are rich. For example, California is pursuing this technology very actively; Nevada and also Arizona. So, we might completely give up gas and coal energy resources and we can completely rely on our solar energy. Sign In or Subscribe to IntelligenceMine to view and search Company News. Royal Nickel Corp. Announced New Drilling Results for Qiqavik, Canada. Royal Nickel Corp. Announced its Financial and Production Results. Glencore plc Announced an Acquisition of Shares. Cobalt mining is hot and getting hotter. Here are the 10 top cobalt-producing countries of 2016, based on US Geological Survey numbers. Cobalt mining and exploration are flourishing, buoyed by excitement about Tesla’s (NASDAQ:TSLA) lithium-ion battery gigafactories and increased worldwide demand for electric vehicles. Lithium-ion batteries require lithium, graphite and cobalt, among other components, and demand for these metals is expected to surge as electric vehicles become more mainstream. Anticipated demand and limited supply have led to strong gains for cobalt in particular this year, and investors are becoming more interested in this metal. With that context, here’s a look at the top 10 cobalt-producing countries of 2016, as identified by the US Geological Survey. Cobalt is usually produced as a by-product of copper and nickel, so countries that produce high quantities of those metals generally put out a lot of cobalt as well. The DRC is the world’s largest producer of cobalt, accounting for roughly 53 percent of global production. The country has been the top producer of the metal for some time. The DRC’s output in 2016 increased by 3,000 MT compared to 2015. According to Mining Weekly, the DRC will receive increasing amounts of foreign investment in the coming years, mostly from China, as a result of its low production costs and high-quality minerals. But cobalt mining in the DRC has also been related to human right abuses — earlier this year, Apple (NASDAQ:AAPL) announced that it has temporarily stopped buying cobalt mined by hand in the DRC. China saw no change in its cobalt production from 2015 to 2016. Much of the country’s output comes from ore and partially refined cobalt imported from the DRC, though scrap and stocks of cobalt material also contribute to its output, the US Geological Survey says. The Asian nation is the world’s leading refined cobalt producer, and is the top supplier of cobalt to the US. Canada’s cobalt production increased in 2016, rising from 6,900 MT the year before to 7,300 MT. Canadian cobalt comes mostly from large nickel and copper mines that produce cobalt as a by-product of their normal operations. Some of these major nickel and copper deposits are Kidds Creek, Sudbury and Raglan. Several companies are now rushing to Canada stake land in the hunt for cobalt. In the coming years, the country’s production is likely to expand as new sites are identified. Russia bumped Australia out of the number-four spot to become the world’s fourth-largest cobalt producer in 2016. Russia’s production remained the same from 2015 to 2016, at 6,200 MT. That said, the country plans to significantly increase its cobalt production over the next several years, as per a statement from an official spokesperson for Denis Manturov, Russia’s minister of industry and trade. Australia saw a drop in cobalt production from 2015 to 2016, with output sinking from 6,000 MT to 5,100 MT. Like many other countries on this list, Australia’s cobalt is a by-product of copper and nickel mining. The country’s nickel mines are located in the western part of the country, mostly around the Kalgoorlie-Leonara regions. In 2016, Zambia climbed the ranks to become the world’s sixth-largest cobalt producer. The country’s cobalt production for 2016 remained the same as it was in 2015 — it came in at 4,600 MT for both years. Cuban cobalt production remained fairly steady in 2016 at 4,200 MT; that’s up slightly from 4,300 MT in 2015. The country’s Moa region is home to a joint venture nickel-cobalt operation between Canadian firm Sherritt International (TSX:S) and General Nickel Company of Cuba. The venture struggled last year due to a bridge collapse brought on by Hurricane Matthew; it resulted in the deaths of four employees. Last year, the Philippines produced 3,500 MT of cobalt, down 800 MT from the amount produced in 2015. The fall was largely due to the country’s decision to shut down 28 mines due to environmental concerns. The Chamber of Mines of the Philippines has since warned that the value of the country’s metallic mineral production could go down by as much as 50 percent this year. The fate of mining in the Philippines is up in the air as President Rodrigo Duterte and recently appointed Environment Secretary Roy Cimatu deliberate over a country-wide ban on open-pit mining. Madagascar’s cobalt production dropped in 2016 from 3,700 MT to 3,300 MT. According to MBendi Information Services, the Ambatovy nickel-cobalt mine is the largest and most advanced mineral project in the country. It is located about 80 kilometers east of Antananarivo. Sherritt International owns 40 percent of Ambatovy, which cost more than $5 billion to develop. Last year, the company announced a C$1.6-billion writedown of the value of its stake in the mine. Rounding out the list is New Caledonia, whose cobalt production dropped slightly from 3,650 MT in 2015 to 3,300 MT in 2016. A subsidiary of France’s Eramet (EPA:ERA) mines substantial deposits of oxidized ore (garnierites) at four mining centers located in the north and south parts of the country. The ore is processed at the company’s Doniambo smelter, which is the world’s largest ferronickel-producing plant. The sun shines everywhere in Maryland. But too few Marylanders could take advantage of solar energy before the advent of a statewide community solar 3-year pilot program of approximately 196 MW. Community, or shared, solar makes it possible for anyone with an electric bill to access solar energy, even if they can’t put it where they live. Shared solar means photovoltaic (PV) systems can be somewhere else in the community (in a field, on a building, over a parking lot, and elsewhere) but provide the benefits of solar electricity to participating subscribers. Community solar also represents a significant opportunity to expand direct access to Maryland’s renewable energy economy to everyone in the state. A successful pilot program that delivers energy savings to a wide variety of participants and builds a diverse portfolio of shared renewable projects will broaden and deepen the state’s constituency for renewable, clean, distributed energy. It will also make the case for a permanent and expanded program. Now that the program is officially launched across much of the state, Solar United Neighbors decided to take a closer look at community solar in Maryland to date. In our recently released report that is the first of its kind about the Maryland program, we cover its history and structure, and highlight some projects happening across the state before investigating some of the programs successes and challenges so far. The report is meant to establish a baseline for future analysis of Maryland’s community solar program. We will be revisiting the program to track its progress in future reports, so that a future, permanent program can build on the pilot’s successes and learn from any mistakes made. This post captures some of the report’s highlights and key takeaways from the status of Maryland’s community solar program. With a specific provision in the legislation to “encourage developers to promote participation by renters and low-income and moderate-income retail electric customers,” the legislature made its intent clear. The regulations attempt to comply with this intent by allocating 30% of the program’s system size allocations (~196 MW over three years) to projects that provide at least 30% of the kilowatt hour output to low-and-moderate income (LMI) subscribers. In effect, the program has created a scarce and desirable resource (space in the program) and then sections off part of that resource for LMI projects. So far, the LMI category is unfilled in Pepco territory, but, in other territories covered by BG&E, Delmarva, and Potomac Edison, LMI project capacity is completely allocated for the first year. This is very encouraging. What remains to be seen is whether these LMI-focused projects will be able to find financing, find customers, and deliver meaningful savings to low-to-moderate income subscribers. Community solar is often assumed to mean large-scale, multi-megawatt installations with shares divided among a large number of people. The concept however, also has the potential for smaller-scale and community-focused projects to flourish if the program allows them the space to do so. These smaller projects, while not as cost effective on a per-watt basis as a larger installation, hold the potential for community members to take a more active role in project development and management. They can also allow for communities to retain more of the economic value it produces. The Maryland program regulations include several provisions to support these types of projects. The U.S. International Trade Commission last week made public a report sent to President Donald Trump detailing three proposed trade duties aimed at protecting domestic solar panel manufacturers. The ITC report, filed on Friday, details how the agency arrived at its unanimous decision in September that the importation of cheap solar panels is unfairly harming U.S. solar panel producers. None of the proposed remedies changed between their announcement at the end of October and the official filing. President Donald Trump has 90 days to review the recommendations and make a final decision, which could come as late as January. Meanwhile, a final hearing will take place at the Office of the U.S. Trade Representative on Dec. 6. There isn’t a lot of new information in the detailed report sent to Trump by the ITC, but it does compile hours of testimony and research, providing insight into how the agency arrived at its unanimous injury ruling in September. At the end of October, the four sitting commissioners recommended a series of remedies composed of quotas, tariffs and a licensing fee to impose on imported chrystalline silicon photovoltaic cells and modules — the most popular type of material for solar panels. The decision is a result of a rare Section 201 investigation, requested in April by Georgia-based solar manufacturer Suniva, which filed for bankruptcy protection earlier in the same month. SolarWorld, another domestic solar manufacturer, later joined. The two companies are pushing for a combination of tariffs, quotas and a floor price to remain in effect for four years — the longest period duties can remain in effect before review and potential renewal. The Commission did not accept the companies’ proposed remedies, instead proposing a more modest set of duties that included a suggested licensing fee from Solar Energy Industries Association — a solar trade group vehemently opposed to the tariffs. The proposed remedies would be impose on imports from South Korea and Mexico. China and Taiwan already had duties imposed on their CSPV modules and cells in 2012 and 2015. The proposed remedies sparked mixed reactions from both sides of the trade case. SEIA and its supporters were relieved that remedies were not as stringent as feared, but continue to aggressively lobby the Trump administration. Suniva and SolarWorld, on the other hand, expressed disappointment and said the proposed remedies were not strong enough to help the companies restart domestic operations. The ITC report is an official recommendation to the president, but Trump ultimately holds the final decision. The White House has the option to do nothing, devise stiffer tariffs or other remedies or impose the ITC’s recommendations. Trump has reportedly expressed a general desire for tariffs, and the solar case may fit the bill. However, proposing tariffs could provoke retaliatory actions from other countries. Representatives from China said at the ITC remedy hearing in October question the legality of the injury ruling, likely setting up a fight at the World Trade Organization. According to GTM Research’s Shayle Kann, few remedies from past Section 201 cases lasted the full four years because of challenges at WTO. A Bloomberg report noted China could target Kentucky bourbon and Wisconsin cheese in a similar manner, indirectly affecting House Majority Leader Mitch McConnell (R-KY) and Speaker of the House, Paul Ryan (R-WI). That would create natural opponents, R Street Institute trade analyst Clark Packard told Bloomberg. The solar trade case already created unusual alliances. Conservative think tank Heritage Foundation and the American Legislative Exchange Council came out against the proposed tariffs. Should Trump impose the ITC’s remedies, it would mark a departure from the economic blueprint laid out by his conservative allies. The case even made headlines at Fox News as the two sides seek to sway Trump through his preferred media outlet. The House of Representatives last Thursday passed a tax overhaul bill that slashes incentives for wind power projects, turning the focus to the Senate, which is considering its own tax reform legislation that would leave those incentives in place. “There is $50 billion of investment at risk,” Evan Vaughan, spokesman for the American Wind Energy Association (AWEA), told Utility Dive. While the House bill poses a considerable threat to the wind industry, analysts contacted by Utility Dive believe the friendlier Senate version will prevail, at least when it comes to wind-specific items. But broader changes that exist in both bills could have a mixed impact on the wind power sector. The flow of U.S. wind power development has been lumpy over the past couple of decades as developers have rushed projects into development to beat the expiration of the production tax credit (PTC), which has had a two-year shelf life and has gone through a biennial ritual of expiration and renewal since 1992. That cycle was broken in 2015 when Congress extended the PTC (and the investment tax credit for solar power) by five years, on a schedule that calls for the PTC to end in 2020. The House tax reform bill (HR 1) keeps that schedule and the PTC itself intact, but changes two crucial details. It retroactively ends the inflation adjustment and it changes the definition for construction start. Removing the inflation adjustment rolls back the PTC to 1993 levels, lowering the value to 1.5 cents/kWh from the current 2.4 cents/kWh. “It is a retroactive tax hike,” Vaughan said. The construction start date sets an eligibility deadline for the PTC. That is particularly important in the current environment because developers have been rushing to get their wind projects into construction ahead of each step-down. In 2018, for example, the PTC credit is set go down to 60% of the value of the credit. The Internal Revenue Service administers the PTC and sets the eligibility requirements. Under existing IRS rules, there are two ways to qualify for the PTC: physical work of a significant nature or the 5% safe harbor rule. Most developers have taken the safe harbor option, under which a project qualifies for the PTC if the developer spends 5% of capital costs by the eligibility deadline. The House tax bill retroactively removes the safe harbor option, meaning that developers that have already qualified for safe harbor would have to requalify under the revised rules of the new tax bill, and that would put them into the next step-down to the PTC, cutting the tax credits they would receive by 20%. The head of Puerto Rico’s embattled electric utility, Ricardo Ramos, has resigned following intense scrutiny over a contract signed with Montana-based Whitefish Energy to repair and rebuild the island’s electric grid. The news comes just days after Ramos, executive director of the Puerto Rico Electric Power Agency, answered questions about the contract’s negotiation before the U.S. Senate Energy and Natural Resources Committee. Days after Hurricane Maria devastated the island, PREPA contracted with Whitefish to repair the grid rather than utilizing mutual aid agreements with other utilities. As terms of the $300 million contract came to light, it set off a firestorm of criticism that resulted in the deal being canceled and has now led to Ramos’ ouster. It’s been two months since Hurricane Maria made landfall, but in some ways the storm has not subsided. The island still only has less than half of its generation online and today the head of its electric utility stepped down amid fierce criticism over the slow recovery and its deal with Whitefish. Details are still scarce, but NBC News reports a statement should be forthcoming form PREPA later on, and it is not yet known if Ramos will remain in his position until a successor is found. Ramos appeared before a Senate committee on Tuesday, ​and told lawmakers the utility contracted with Whitefish because he believed PREPA was “unable to meet requirements” for mutual assistance with the American Public Power Association. Those requirements include points such as providing fuel, housing and communications; however, emails released by the House Natural Resources Committee show that PREPA purchasing managers did not follow advice from their lawyers in signing the Whitefish contract. The contract remains the subject of a federal law enforcement probe. In addition to eschewing mutual aid, the contract was not competitively bid, contained provisions limiting oversight and recourse, and specified hourly wages and expenses for linemen far in excess of what is typical on the island. To boot, much of those wages were not going to the workers. Both Puerto Rico and its utility are mired in debt, and the storm recovery story has merged into one of mismanagement.Puerto Rico Gov. Rosselló requested $94 billion in disaster aid from Congress, but pushed lawmakers not to exercise more federal control over the territory’s decision making. PREPA and Puerto Rico’s federal oversight board will work together to reform the utility, which could include partial or entire privatization, he said. On Monday, a judge rejected a move from the federal oversight board that manages Puerto Rico’s finances to appoint a “chief transformation officer” to direct the grid rebuild. Ramos’ departure is not the only one. The head of the Puerto Rico Emergency Management Agency resigned last week amid the recovery efforts. PREMA Commissioner Abner Gómez in a statement acknowledged the slow recovery efforts; government officials had indicated in the last two weeks that he was “exhausted” and had been on vacation. Stephen Byrne will retire as senior vice president ofSCANA, and COO and president of generation and transmission of SCE&G. The V.C. Summer debacle appears to be having an impact on SCANA’s management, with Marsh’s resignation coming just days after a key lawmaker in the state said he should step down. Waste Management’s innovative Solar-Powered Trash Compactor helps keep public spaces clean and can reduce trash collections by up to 80%. Bigbelly was founded in 2003 with the goal of transforming one of the least efficient and resource-intensive industries: waste collection. Cities were either collecting too often and wasting fuel and labor while emitting excess CO2, or alternatively, they were not able to keep up with the demands and overflowing trash cans that created litter, health, and safety issues. In the following years, we evolved to offer a unique and complete solution by leveraging renewable solar energyand information technology. Bigbelly is a Smart Waste Management, Smart City, and Internet of (IoT) Things industry leader and is recognized as a C40 Cities Climate Leadership Group best practice. Industry knowledge & longevity in the market provides us with unparalleled insights backed by extensive data, analytics, and customer successes. Powered by the sun, our eco-friendly compactors work in every kind of weather — snow, rain or shine. These remarkable machines are available with or without companion recycling kiosks and can be covered with the exterior design of your choice. By compressing its contents, the unit gains capacity, so it doesn’t have to be emptied as often. Fewer collections mean cost-savings for labor, fuel and maintenance and reduced greenhouse gas emissions. Powered by the sun, our eco-friendly compactors work in every kind of weather — snow, rain or shine. These remarkable machines are available with or without companion recycling kiosks and can be covered with the exterior design of your choice. 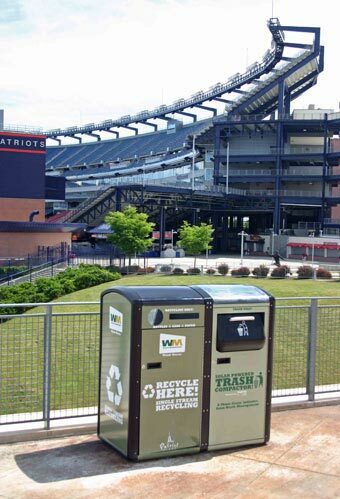 Solar-Powered Trash Compactors and recycling kiosks are perfect for cities, community centers, parks, beaches or other high-traffic areas. The Washington Center has partnered with the U.S. Naval Research Laboratory (NRL) to encourage students from underrepresented backgrounds to pursue careers in scientific research. Participants receive an introduction to professional laboratory research and perform hands-on work at the Naval Research Laboratory in Washington, D.C. The interdisciplinary research performed at NRL gives interns exposure to a variety of fields including materials science and engineering, chemical and biochemical engineering, aerospace engineering, physics, synthetic chemistry, biochemistry, molecular biology, computer science, mathematics, mechanical engineering and electrical engineering. Research interns are active participants in major research programs at the NRL, working a minimum of 40 hours per week under the guidance of senior NRL staff. Each intern will be assigned a mentor who will provide a 10-week planned research outline of assignments and expectations. In addition, interns will attend scientific and skill-set seminars and participate in select weekend activities arranged by Program Directors. Learn more here. Travel is provided to and from Washington, D.C., up to $700 total. Once a student is accepted into the program, Washington Center staff will work with the student to book their flight, their train or to discuss gas reimbursement if the student chooses to drive a personal vehicle. Students who elect to stay in Washington Center-provided housing will receive a reduced stipend for the program. Interns can also elect to make independent housing accommodations. Students choosing to live in Washington Center-provided housing will have access to a complimentary shuttle that will transport them to and from the Naval Research Laboratory each work day. Internships are awarded competitively to students who have completed at least one year of undergraduate training in science, mathematics or engineering. U.S. citizens or have permanent residency. Enrolled at a Historically Black College or University, Minority Serving Institution or Tribal College or University. Currently maintaining a 3.0 cumulative GPA or higher. Preference is given to students planning careers in science, technology, engineering and mathematics (STEM) disciplines. This program is not intended for pre-meds. Prior laboratory experience is desirable. Applicants should be U.S. citizens or U.S. permanent residents, be majoring in a STEM subject, and be interested in complex laboratory work. California utilities are well-ahead of the state’s renewables portfolio standard — already the most aggressive in the nation — and by some accounts may be supplying 50% carbon-free energy a decade ahead of schedule, according to a new report from California Public Utilities Commission (CPUC). As of this year, 43.2% of San Diego Gas & Electric’s energy supply comes from renewable resources; 32.9% for Pacific Gas & Electric; and 28.2% for Southern California Edison. CPUC’s report also concludes the state’s aggressive RPS program has helped drive down the costs of renewable energy. Between 2008 and 2016, the price of utility solar contracts declined 77%. Between 2007 and 2015, prices of wind contracts reported to the CPUC have declined 47%. Its been 15 years since California regulators directed utilities to include renewables into their energy mix, and in that time, much progress has been made. The state is now targeting 50% renewable power by 2030 and could reach that much sooner. But the report yesterday finds utilities well ahead of even interim targets, and possibly on their way to supply 50% green power within the next three years. CPUC Commissioner Clifford Rechtschaffen, who oversees the agency’s renewables standard proceeding, touted California’s position as a national leader on climate. There have been signs the state could push even farther. Over the summer, California lawmakers considered setting interim goals that could lead to 100% renewable energy by 2045. California Gov. Jerry Brown (D) was in Germany on Monday for international climate talks. “We don’t want to do nothing and just sit there and let the climate get worse,” he told the San Francisco Chronicle. With one of the largest economies in the world, the state has taken up the mantle as a leader on fighting climate change, even as the federal government has pulled out of the Paris climate accord, aimed at keeping global warming under control. The CEO of the Puerto Rico Electric Power Authority told Senate lawmakers on Tuesday that he signed a $300 million contract with Whitefish Energy for power restoration due to difficulties with mutual assistance programs offered by other utilities. PREPA CEO Ricardo Ramos said that after Hurricane Maria he believed the utility was “unable to meet requirements” for mutual assistance with the American Public Power Association, such as providing fuel, housing and communications. Emails released by the House Natural Resources Committee, however, show that PREPA purchasing managers did not follow advice from their lawyers in signing the Whitefish contract, now the subject of a federal law enforcement probe. Puerto Rico Gov. Rosselló requested $94 billion in disaster aid from Congress, but pushed lawmakers not to exercise more federal control over the territory’s decisionmaking. PREPA and Puerto Rico’s federal oversight board will work together to reform the utility, which could include partial or entire privatization, he said. 3 Strategies to Accommodate DER Growth Case study explores 3 North American regions and how utilities there are addressing challenges as they face DER integration and growth. The Senate Energy and Natural Resources Committee and the House Natural Resources Committee both held hearings on Tuesday to investigate power restoration in Puerto Rico — and in both, the Whitefish contract was a central focus. PREPA contracted with Whitefish on Sept. 26, days after Hurricane Maria struck Puerto Rico, signing an agreement without a competitive bidding process that did not allow the utility or government officials to review rates or profit margins. Ramos told lawmakers he and his team opted for the previously unknown company because he was unsure PREPA could provide logistical assistance for mutual aid workers from other utilities. Ramos cancelled the Whitefish contract in late October at the urging of Gov. Rosselló, turning back to mutual aid agreements from APPA and other utility groups. APPA declined to address Ramos’s comments about logistics after the storm, but said it is now working with the utility on power restoration. Rosselló said he and PREPA are open to working with federal officials, including the oversight board, set up last year by Congress to oversee Puerto Rico’s progress through a bankruptcy process. Last week, the head of that board asked Bishop’s House committee to clarify that it has the authority to appoint new leaders to public agencies like PREPA — authority curtailed by Monday’s court ruling. “To avoid uncertainty and lengthy delays in litigation, congressional reaffirmation of our exercise of our authority is welcome,” said Natalie Jaresko, head of the oversight board. While an appeal could still be filed, the Monday ruling likely means Jaresko’s board will need to work with existing PREPA management and Puerto Rico utility regulators to guide the grid rebuild. At the Senate hearing, Jaresko said the ruling was a “setback,” but the board still has “the authority to review fiscal plans” for PREPA. Jaresko laid out a three-part plan for PREPA, including the finalization of a new fiscal plan by Feb. 2 and contract reviews for every deal over $10 million. Rosselló said PREPA would be ready to work with Jaresko’s board, but said it has only the power to review and suggest, not make final decisions for the utility. Just how much power the fiscal board has over PREPA could change in the coming weeks. Congressional lawmakers could write in new oversight stipulations to any disaster aid package, or move to affirm the board’s authority to intervene in financial decisions. After the hearing, Bishop said it was “premature” to speak about specifics, but that PREPA’s record demands more oversight of their practices.